We hope that you have been enjoying your time out on the river with the nice wether that we have been having recently! It has come to that time of year again that all members need to renew their membership, if you are yet to do this please see our membership page for info on how to do it! Hi everyone, hope you’re not too busy in the lead up to the Christmas period and are still managing to get on the water! The dates for our spring 2019 pools sessions have been released and are available for booking, more information can be found on the courses section of our website found here. The pool sessions are a great way for paddlers to practice vital skills such as how to capsize and maybe even how to roll in a warm controlled environment. 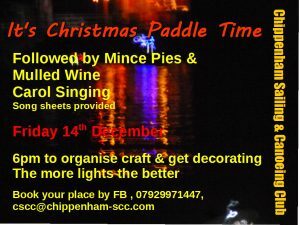 The Christmas paddle is of course weather dependent, and a decision will take place on the day, and choice of craft to go out. However that doesn’t stop us having a good evening in the club house. If any one want to bring an instrument to help the carol singing along please do. 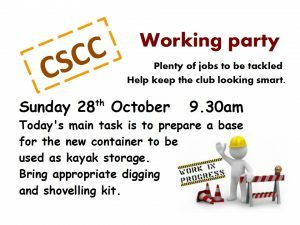 Working party this Thursday 2nd August. 5. List will be added to on the night. Gentle reminder to be careful with fires in club grounds this heat wave. Please contact 01249 656170 / 07929 971447 if you are interested in attending. A paddle to find different pictures of tails that are floating in the river and identify them. Can dress up as tales of riverbank characters? Members should be ready to go from 6PM at the club if you want to participate. As always we hope you have a great time on the water this month and that you can attend some of our upcoming events that are happening. Thank you for making our club so great. July to December club events list now out! Saturday July 7th 5pm – Wombles of Chippenham – dress up paddle as wombles (optional) and collect rubbish from the river. A clear up paddle! Followed by a BBQ Bring your own food to cook on our BBQ. 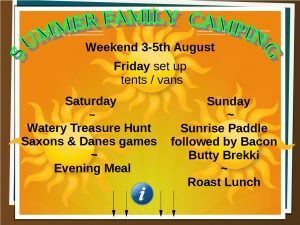 Sunday 15th July 3pm -Teddy Bear’s picnic – paddle and a picnic on the water. Thurs 19th July 6pm – Paddle, Camera, Action – photography paddle, capture scenery , wildlife or action shots! Followed by fruity puddings! 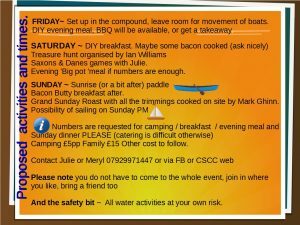 Sun 5th Aug 6am– Up with the Lark – early morning paddle followed by a bacon butty. Tuesday 11th Sept – Tails of the River Bank followed by AWARDS night – a paddle to find different pictures of tails that are floating in the river and identify them. Can dress up as tales of riverbank characters? This will be followed by the awards evening – if you have been on a course (even if a non-member) we encourage you to attend as you will be awarded a certificate and where applicable the relevant star award form. Friday 21st Sept 6pm – Chinese evening – Make paper lanterns to float on river or on jetty & paddle , Chinese dress and a Chinese buffet! Friday 19th October– What you were wearing when the boat went down! 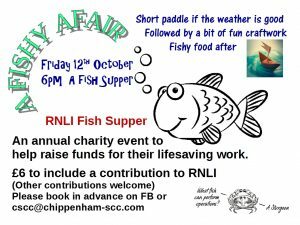 – anything goes fancy dress paddle followed by fish and chip supper. 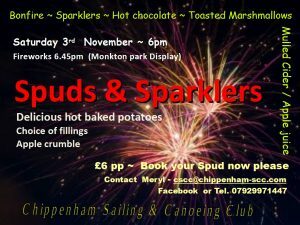 Fri 23rd Nov 7pm– Knots & Nibbles – bring nibbles to share and learn some useful knots for securing boats etc. RYA Senior Dinghy Instructor holding current certification. section of the River Avon to the east of the town of Chippenham. The club has club sailing dinghies and canoes, and offers sport for all. offers a great deal of new experience. sports, meet like minded people, and keep fit. develop club sailing to RYA Sailing training centre status, as official “RYA Principal”. and kayaking, this is an ideal opportunity. this with as an RYA Principal, liaising with the RYA. Please contact the club email address in the first instance.